Here's my story. In 1994 I was a college-bound high school senior that loved art, especially drawing. I knew I wanted to use my creativity as a career but didn't know exactly what to do. I remember the day when one of the art supply closets was reconfigured into a small, 3 computer lab. The computers were all Power Macintosh 6100/60s with a System 7 OS -- and nothing like I had ever seen before. I cannot recall what art program was on them but they kept drawing my attention every time I went to art class. We got them late in the school year, so I was only able to play around with them as no formal classes were started until the fall -- and I was about to graduate. We couldn't afford anything like that growing up so I thought I was lucky to just have a few weeks to take in that new user experience. After moving into the dorm for my freshman year in college, we had an Apple computer lab in the building and the Internet was still new and we didn't know what to do with it besides looking up things we weren't supposed to -- come on, we were all 18 year old boys!. Anyway, we wrote papers on Macs and used search engines such as Webcrawler, Lycos, Go.com, and Infoseek. I didn't see those machines as the creative machines that I played with in high school; rather, as machines that we were required to use to do homework. But I hadn't forgotten about what awesome powers they possessed for being creative. Jump to sophomore year in the fall of 1995. One of my roommates shows up after summer break with a 1993 Apple Color Classic and I realize what a fantastic little machine it was. Not only could I write papers and play simple games, but I could create little pixel drawings and use type! That feeling I had during my senior year art class was back. I finally realized what I wanted to do for a living and I had found my digital, Apple-carved canvas. In the second semester of my sophomore year, I enrolled in an intro course to Graphic Design and loved/excelled in it. Being able to express my creativity on that new medium felt breathtaking. While taking design classes, I would do some evening computer lab work in the art building up on the third floor where they had a more focused lab used for computer graphics and "digital photography" -- it was a new term at the time and people were excited. Along with my graphic design classes, I started a digital photography class and that was where I was first introduced to the Apple QuickTake Camera and Adobe design software. While graphic design taught me history, practice, typography, and what is good layout, digital photography taught me scanning, Photoshop/Illustrator, and basic HTML coding. It was the best of both worlds, really. I was getting my minor in art history as well so it felt like a very balanced approach towards getting my BA in Studio Art with focus on Graphic Design. After graduating college in August of 1998, I knew I had to go into debt and buy the original Bondi Blue iMac. I loved the machine: an entire PC, wrapped in a space age color casing that wasn't beige? Who wouldn't want one? I used it for some small freelance work, Internet, and gaming. Soon after, I started my job as a graphic designer for a daily newspaper and worked on Macs every day. We had Quadras, PowerPCs that evolved into G3/G5/G5 towers and iMacs in the nine years I worked there. 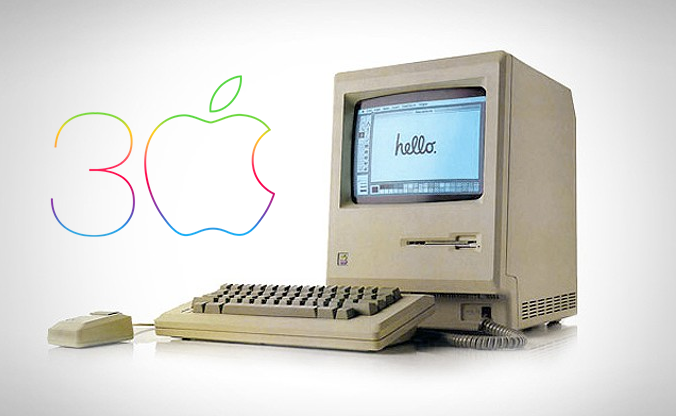 Not only did I have the design background but I now had the technical knowledge of how those machines worked as our IT admin only knew Windows so I was not only the Graphic Design Supervisor, I was also the Mac admin. In 2002 I added a Titanium Powerbook G4 -- one of my favorite Macs of all time -- then bought a Power Mac G5 Dual Processor in 2004. In 2007, I completed the full circle and purchased another 24" aluminum iMac, but this time a much larger and faster version. After almost 7 long years, the longest I've ever had a computer, the hard drive died just weeks ago. Rather than sell this (still) awesome piece of computing history, I'm going to give it a new hard drive and a second chance on life, much like Steve Jobs gave Apple one when he returned in 1997. Apple has been such a big influence in my professional life and personal life. With devices like iPods, iPhones, and iPads, Apple has truly changed how their users have evolved and who they are today. It's amazing how at one time a computer took up an entire room and now it easily fits in our pocket. The old saying is right,"the Apple (user) doesn't fall far from the tree". This is my #Mac30.